Jake Gyllenhaal is truly one of the best actors we have today. He is consistently performing at high levels no matter what the film or how meaty a role. This was one of the problems. In the film, we see Bauman struggling not only with the loss of his legs, which was certainly enough of a challenge, but also struggling with the concept of people looking up to him or being inspired by him. Bauman could not understand why these people were turning him into a hero and felt confused as to the reasoning. This was one of the most intriguing aspects of this film because it was something that we hadn’t seen before. Gyllenhaal was again spectacular in this role. He has a remarkable skill of being able to lose himself in a role. Most big stars, even in good performances, are basically that star. Every time you see a Tom Cruise movie, Tom Cruise is basically playing a version of himself (yes, there are exceptions, but you get the idea). Gyllenhaal, on the other hand, is like a chameleon in a way because I never once looked at this movie and thought to myself, “hey, it is Jake Gyllenhaal acting.” Instead, he was the character he was playing. Nightcrawler is another brilliant example of a time when Jake becomes more than his star. Tatiana Maslany, from Orphan Black fame, played Bauman’s girlfriend Erin and she does a magnificent job as well. The movie does a fantastic job of not only showing how this injury affected Bauman, but also how it affected the people in his life, especially Erin. This relationship felt real and was another strength of this movie. The story is very powerful and can hit hard many times. There are a lot of emotional blows throughout the film that do not feel exploitative. The film is also very much a love letter to Boston. Boston Strong is a huge theme moving through the movie and the background actors are very realistic in their Boston behaviors. 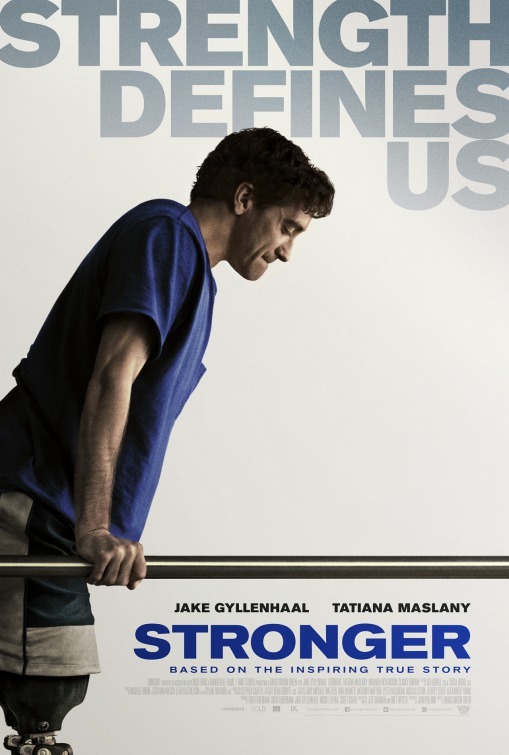 Stronger is a really great film with a fantastic pair of performances from Jake Gyllenhaal and Tatiana Maslany. It is an emotional ride in a serious and troubling manner. It might be a little too long and there may have been too much of Bauman’s family involved in the story, but the film wisely takes its time to develop the characters that we really need to see. Jeff Bauman did not feel comfortable being the symbol of hope to the people of Boston and it nearly destroyed him.